Writer's Digest Books, 9781440348174, 328pp. If you want to publish a book, you must present it to agents and publishers with a knock-your-socks-off proposal. Whether you're seeking a traditional press to publish your self-published book or trying to win over an agent for your graphic novel, memoir, or nonfiction title, you need an irresistible proposal. 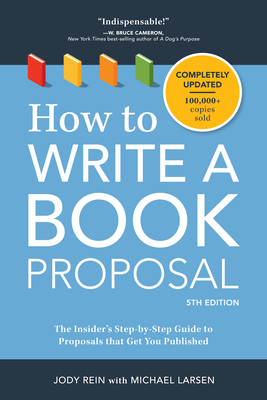 The better your proposal, the better the editor, publisher, and deal you will get. A list of the "Top Ten Proposal Killers"
This sassy, thorough guide from industry professionals Jody Rein and Michael Larsen will become your go-to for advice about publishing. Jody Rein, former executive editor with divisions of HarperCollins Publishers and Penguin Random House, is the founder of boutique literary agency Jody Rein Books, Inc., and respected publishing consulting and coaching firm Author Planet Consulting. Jody has represented, published and coached hundreds of authors through successful publication in every form, from e-books to international bestsellers to major motion pictures.Michael Larsen, co-director of the San Francisco Writers Conference and the San Francisco Writing for Change Conference, is the author or co-author of eleven books. He is an author coach and a former agent, having co-founded the Larsen-Pomada Literary Agency, which sold books to more than 100 publishers and imprints.